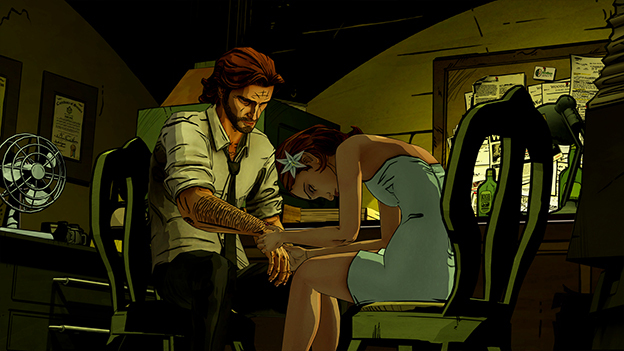 Thus far, every episode of The Wolf Among Us has been centered around a theme. The first episode was about choices and how it relates to information, the second was about morals and how far you are willing to go to see justice done, and the third was about suspicion and personal vendetta. Now episode 4 is out, and its theme is all about filling in the blanks and revealing more about the people around you. Your choices, though they still matter, are muted when compared to the exposition the story deals out to you. Your morals take a backseat, as your eyes open to the world that you have been playing in since episode one. Your vendettas are put on the backburner as you finally realize the bigger problems plaguing your society. It all leads up to a magnificent cliffhanger for episode 5, in which you’ll get to decide what sort of Big Bad Wolf you are going to be. The game picks up where episode 3 left off, in a bad way. Let’s get the spoiler warnings out of the way right now because you just can’t talk about this episode without talking about the plot. So if you don’t want the game spoiled for you, fast forward to the end and rest assured that the game is still as great as it ever was. 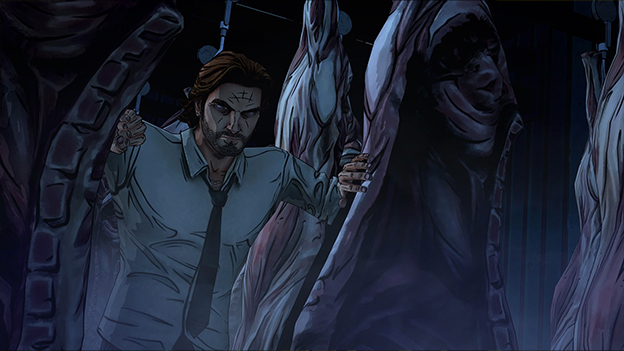 Bigby is an absolute wreck. After getting shot with a hollow point silver bullet and having his arm broken so hard the bone is sticking through the skin, Dr. Swineheart is patching him up. Colin the pig and Snow are there as you reset your own screwed up arm and have bullet fragments picked out of your internal organs, but they only seem to be bickering. Colin defends you, and berates Snow for letting Ichabod Crane get away, while Snow talks about how the people of Fabletown are losing faith in their government, and if they ever hope to get the situation under control, they would have to shape up and do everything by the books. This means deporting all the unglamored fables to the farm, no longer letting Bigby wolf out and get violent on suspects, and bringing in the crooked man alive. At first, it seems a little odd that Snow would harp on the details like this, especially the details about deporting unglamored fables, when there is still a murder investigation under way. But that’s when you realize that this is who Snow is. What you are doing, is watching the evolution of Snow White from a somewhat down-spoken underling to the incredible badass/hardass that she was in the Fables comic series (sure, that plays a little fast and loose with Fables canon, but it’s still quite well done.) Snow sweats the small stuff because it’s what is important to her, and she stands as a symbol of the ruling government of Fabletown and the rules that they enforce to attempt to protect everyone. In addition, the game does a fantastic job about bringing your own personal conflict into the scope of broader social issues. The reason why Snow bitched about glamors so much, and the reason why you will run into that issue time and time again, is that these murders--the Crooked Man, the Tweedles, all of them--tie into the same social issues that you ran into in episode one. Fabletown is dying because the less fortunate aren’t helped, and the more fortunate are squandering their resources. Glamors cost too much, New York rent is too high, and people are taking crooked jobs just to get by. The game almost makes you feel that the criminal dealings of the Crooked Man are necessary just for survival. It also does a great job of using characters as symbols for this conflict as well. Aside from Snow coming down hard on you to follow the rules, there is Colin who is afraid of getting deported, Mr. Toad whose place was wrecked by you and who still can’t afford a glamor, the Woodsman, who has no place to go and no role to play in either high or low society, Beauty and Beast, who make horrendous self-centered decisions just to keep up a lifestyle of royalty, and more. You’ll also meet Johaan the Butcher from the Butcher, the Baker, and the Candlestick Maker rhyme, Tiny Tim from A Christmas Carol, and The Jersey Devil as new characters in this episode as well. As a lifetime Jersey resident, I particularly love their take on the Devil’s myth, but I won’t spoil the finer details right here. As the story goes on you are lead closer and closer to the crooked man. You’ll follow Ichabod Crane’s trail, track down Bloody Mary, and expose a deep corruption that has run all throughout Fabletown. As you get closer, you are asked some deep questions. “Who is right?” “Who do you trust?” “Who will you side with?” None of these questions are straight forward “good versus evil” answers. They speak to deeper questions about your own personal views.